This attractive apartment building, which has a one-story limestone base, was erected in 1914 and converted to a condominium in 1989. 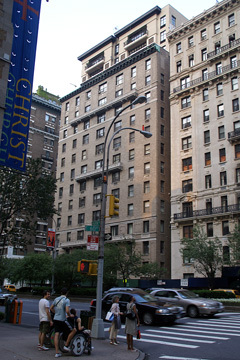 Developer Martin J. Raynes added three penthouse apartments to the building at the time of the conversion by purchasing the air rights from three adjoining buildings on the sidestreet. The addition is not in the same Italian-Renaissance-palazzo style as the rest of the building, which was designed by Schwartz & Gross. The buildings broad avenue frontage is nicely modulated by three very handsome rows of balconies with the middle row shorter than the other two. The composition is nicely capped by an attractive cornice. The sidestreet facade has some balconies also. Schwartz & Gross designed many other apartment houses on Park Avenue including 470, 885, 888, 910, 911, 930, 941, 970, 983, 1045, 1070, 1125 and 1165. 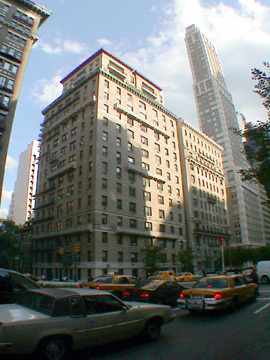 The 14-story, light-beige brick building, which has 48 apartments, has a prime location that is very close to midtown and public transportation, Central Park and the boutiques and restaurants along Madison Avenue. Its rooftop watertank is exposed and it has inconsistent fenestration.